This blog contains posting related to peoplesoft Tools and technologies and specifically targeted towards peoplesoft developers. The Github site has instructions on how to use this utility. I have found some additional challenges when using this utility if you are behind a proxy. The way patch download process works is that you connect to MOS (support.oracle.com) using HTTPS for authentication and use http for actual file download. This requires you use the below command line argument to support for both http and https. The Github site readme only specifies using https, which works for authentication but fails to download the file. I have also found that the code uses (Line 144) conn.setReadTimeout(60000); which is 1 minute. I have found that this may not be sufficient for the busy sites and it fails with the following message. To avoid this issue, I simply changed it to conn.setReadTimeout(6000000); – 100 minutes and used the below to recompile the jar file. Unzip the current jar to extract META-INF\MANIFEST.MF file to the folder where you store the java file. Also change the path to java. The below path are for Windows 8 and JDK 8. All files will be downloadad because download=all was specified. Skip patch 20760982 from list of patches to apply: This patch is not needed. Log file error shows this. Oracle support is able to reproduce this issue however currently no workaround is provided. They have internally 2 bugs opened to address this issue. Portal Home Page Displays Error : Error getting content for remote pagelet. When you are logging on to a Portal Home Page which displays Remote pagelets, You get this error randomly. Error occurred while accessing target page. To see the further details, Please log in to your webserver and open the following log files. If you have more than 1 web server you may have to go to each web server to see the content. Log File Location : $PS_CFG_HOME/webserv/peoplesoft/servers/PIA/logs (This is for PeopleTools 8.53 and higher). If you do not have security issue or single signon issue, Please check the default HTTP Header size allowed by your Load balancer that you use for multiple webservers. In Case of Cisco ACE Loadbalancer default is : 4096 bytes. Increasing it to 32768 helps in resolving this issue. If you use a different Load balancer for e.g. F5 LTM then I believe the default is already 32768. You can contact your Load balancer vendor to determine the default HTTP Header size. 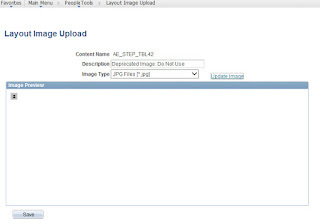 In PeopleTools 8.53 PeopleSoft has provided an online PIA page to upload the images or modify an existing images without using App designer. This is really helpful if you want to change an image, but do not want to migrate application project just for updating the image. For some reason, Mobile Application Platform is hidden in Portal structure and contents, but you can still access the Layout Image Upload page by searching. Once you modify the Parameter, simply restart the Appserver or batch server and it will take effect. There is no need to reconfigure the appserver or batch server. Please note this only work for HTTPS connections for e.g. when connecting to Integration Gateway Web server which only accepts TLS 1.1 or TLS 1.2 connections. To make this also work for LDAP or Directory server that is configured to accept only TLS 1.2 connections for compliance with PCI DSS v3.1 (mandatory after June 30 2016), a code change to $PS_HOME/appserv/classes/psft/pt8/pshttp/PSLdapSSLSocketFactory.class is required so that it uses TLSv1.2 instead of SSL for the below code line. Currently there are no configuration parameters to fix this issue. Please open a support case with Oracle and reference the below bug number if you need the fix for this issue. There is an open PeopleSoft bug to address this issue. 22323376 - LDAP FAILS TO CONNECT TO LDAP SERVER USING TLS 1.2 to address this issue. This will impact any PeopleSoft applications that are considered as PCI In scope applications and uses TLS 1.2 for Autnetication with LDAP Directory server using LDAPS protocol. You will see the following error in the Appserver when connecting to LDAP server using delivered Page. Please note PeopleSoft uses JNDI to connect to LDAP Directory server via delivered Directory Interface Business interlink. If you use Oracle Internet Directory (OID) to resolve database names, then you have this feature enabled by default. With Global database link feature, users can access tables/view in other database using @dbname syntax even when there is no explicit database link is created. For e.g User A logged in to Database A using his personal id : XXXX can run the below query to access table in database b. Only thing that is needed to make this work is that password for the user A must be same in both database A and B. This may create a potential locking situation,if password in database are not synced up and there is an account lock policy implemented to lock account after x invalid attempts. As soon as user runs more than x sql statements using global database link feature, it will lock the account in database b. When you look at dba audit trail, you will see the connection attempt was made by oracle user and machine name will be of database server machine name. This makes it confusing to determine how this account got locked up. If this happens in your environment, Please check if database access id is locked out. If yes, unlock the database access id and restart all your app and batch servers. After the recent upgrade to iOS9 from iOS 8.4.1 on iPAd Air and iPhone 6, PeopleSoft pages appears zoomed and entire UI looks messed up using safari. Our PeopleTools environment is 8.53.12 and this is reproducible in multiple demo environments including HR and Portal 9.1. Screenshot of the zoomed page. Bug 21626379 - IOS 9 BETA 5: CLASSIC PAGES ARE NOT RENDERING PROPERLY. Updates : Issue is not resolved even with release of 9.1 and according to apple support they are still investigating the issue and it will be fixed in some unknown future release. Meanwhile Oracle has provided the workaround. Please test carefully before applying the workaround. for the workaround. It is different for 8.53 and below and 8.54 and above.